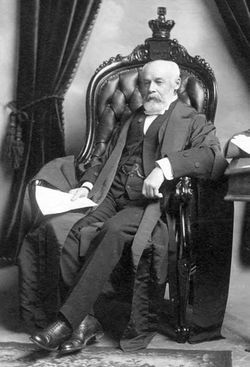 William Hespeler (1830-1921), circa 1903. Source: Archives of Manitoba, Personalities - Hespeler, William 1, N19987. Wilhelm "William" Hespeler: German-Canadian businessman and immigration agent; born 29 December 1830 in Baden-Baden, Grand Duchy of Baden, second son of Johann Georg Hespeler and Anna Barbara (Wick) Hespeler. William married Mary H. Keatchie (d. 1872) of Galt, Upper Canada, on 21 December 1854 and they had three children, two of whom survived to adulthood, Alfred and Georgina. William was married for the second time on 15 December 1874 to Mary Meyer (d. 1883) of Seaforth, Ontario. After her death, William married Catherine (Keatchie) Robertson (d. 1920) on 6 April 1887, a sister to his first wife, in Port Arthur, Ontario. William died in Vancouver, British Columbia on 18 April 1921 and was buried in St. John's Anglican cemetery in Winnipeg, Manitoba. William was raised in a Lutheran family and was educated at the Polytechnic Institute in Karlsruhe. In 1850 he and his mother (his father died in 1840) immigrated to Preston, Waterloo County, Ontario, where he joined his brother's milling, distilling, and general merchandising business. From 1854 to 1868 William served as a partner in the firm of Hespeler and Randall in Waterloo, Ontario, builders of the Waterloo Distillery (Hespeler sold his shares in the firm in 1868 to Joseph Emm Seagram, and the firm eventually changed its name to the Joseph Seagram Flour Mill and Distillery Company). While visiting in Germany in 1872 he learned that large numbers of Mennonites living in southern Russia were considering immigration to North America. Soon after he had reported this to the Canadian officials, they authorized him as a Special Immigration Agent to proceed to Russia, there to assure the Mennonites of a welcome in Canada. After visiting some of the Mennonite settlements his purposes were suspected by the Russian government and he was forced to leave that country. At this point, according to C. Henry Smith, at a meeting in November 1872 at Odessa "with the Bergthal and Molotschna representatives he suggested that they appoint a delegation of competent men to investigate the lands in Canada... The advice was followed the next year. From this time on Hespeler was the representative of the Canadian government in everything that was connected with the immigration of the Russian Mennonites to Canada and their settlement upon their chosen lands." Hespeler had close dealings not only with Mennonite settlers but also with Icelandic and Jewish settlers. Hespeler became Commissioner of Immigration and Agriculture in Winnipeg (1873-1883) and later acted as Consul of the German Empire for Manitoba and the North-West Territories (1883-1909). He served as chief commissioner of census for the Province of Manitoba in 1881. From 1883 to 1894, William was Manager of the Manitoba Land Company, then later a member of the board of the Royal Trust Company and the North of Scotland Mortgage Company. In 1880, he organized The Northwestern, a German language weekly, the first German newspaper in the Northwest. He was a member of the board for the Winnipeg General Hospital starting in 1878, and served as its president for more than a decade starting in 1889, resigning from the board in 1909. In 1899, Hespeler was elected to the Legislative Assembly of Manitoba as an independent for the rural riding of Rosenfeld, and chosen Speaker of the Legislative Assembly, one of the first foreign-born citizens to be so in the British Empire. Redistribution eliminated the riding of Rosenfeld in 1903 and Hespeler chose not to run again. Hespeler's German connections tainted his reputation during World War I, and his role in society declined. After the death of his third wife in 1920, William moved to Vancouver to be near his son Alfred. He died soon after. His obituary remembered him as a man "who was at one time so foremost in the life of the province." In the Public Archives of Canada there are still a large number of reports, letters, and telegrams by Hespler concerning the Mennonite immigration. Correll, E. H. "Mennonite Immigration into Manitoba, Sources and Documents." Mennonite Quarterly Review 11 (1937): 196-227, 267-83; 22 (1948): 43-57. "Memorable Manitobans: William Hespeler (1830-1921)." The Manitoba Historical Society. 5 November 2012. Web. 21 September 2013. http://www.mhs.mb.ca/docs/people/hespeler_w.shtml. Sauer, Angelika. "Hespeler, William (Wilhelm)." Dictionary of Canadian Biography, vol. XV (1921-1930). 2005. Web. 21 September 2013. http://www.biographi.ca/en/bio/hespeler_william_15E.html. Smith, C. Henry. The Coming of the Russian Mennonites. Berne, IN, 1927: 49-50. Wikipedia. "William Hespeler." Web. 21 September 2013. http://en.wikipedia.org/wiki/William_Hespeler. Gingerich, Melvin and Richard D. Thiessen. "Hespeler, William (1830-1921)." Global Anabaptist Mennonite Encyclopedia Online. September 2013. Web. 25 Apr 2019. http://gameo.org/index.php?title=Hespeler,_William_(1830-1921)&oldid=143405. Gingerich, Melvin and Richard D. Thiessen. (September 2013). Hespeler, William (1830-1921). Global Anabaptist Mennonite Encyclopedia Online. Retrieved 25 April 2019, from http://gameo.org/index.php?title=Hespeler,_William_(1830-1921)&oldid=143405. Adapted by permission of Herald Press, Harrisonburg, Virginia, from Mennonite Encyclopedia, Vol. 2, p. 718. All rights reserved.